The following examples, illustrate the techniques for developing Precedence and Arrow Diagram CPM schedules. 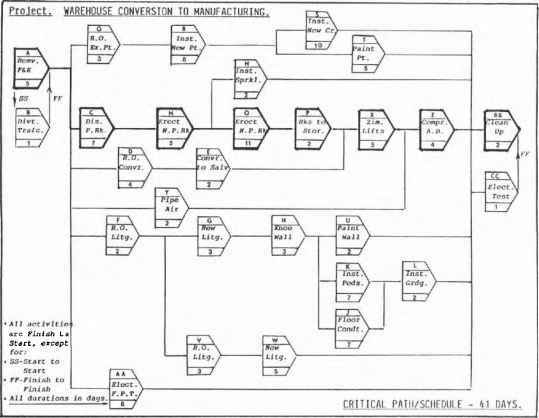 This example shows a Precedence Diagram approach to the conversion of a building from warehousing to manufacturing. The worked case history, Figure 10-1, shows a typical Work Breakdown Structure (WBS), that includes the estimated number of men, duration and labor cost. The completed logic diagram is shown in Figure 10-2. 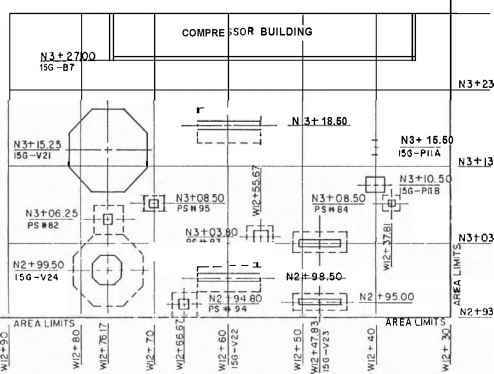 The plot plan for a small plant is shown on Figure 10-3 with 6 major pieces of equipment, plus all services to be installed. A WBS and "scheduled assumptions" are shown in Figure 10-4a paragraphs 5 and 6. An "economic" construction schedule is required and the case solution of 16 weeks project duration is shown in Figure 10-4b. This case covers the same project as (item lb) except that, this time, the work is required to be completed as soon as possible, via a S/T. Figure 10-4a, paragraph 7, outlines the schedule assumptions and the WBS is shown in Figure 10-5. This WBS is more detailed than that shown in case lb., as an S/T usually requires greater detail in the planning and scheduling program. The case solution is shown in Figure 10-6. This shows that the 16 weeks economic program of case lb. can be compressed into 3 weeks, with a 7-day, 24-hour-day S/T. The following examples show the development of a conceptual and detailed estimate. This estimating example is for the same project as shown in the schedule, cases 10-1 b., and 10-lc. Figure 10-3 shows the plot plan. A conceptual estimate is developed on a statistical basis, by judgment and an historical data base. 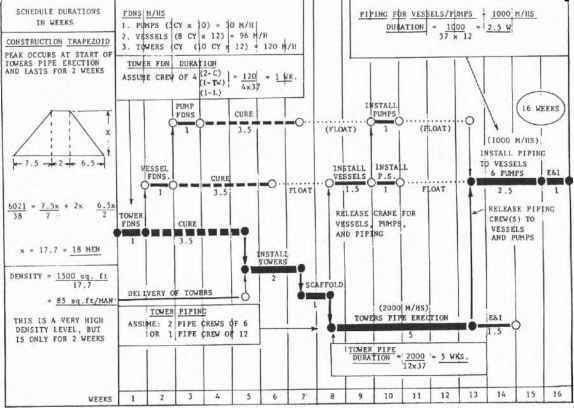 Figure 10-8 shows the statistical development to the total project cost, starting from a "known" base of 3613 direct manhours for equipment and piping installation. Through experience, judgment and historical data, the statistical breakdown for this project, shown in Figure 10-7, is developed. The total cost and engineering manhours are then "factored" as shown in Figure 10-8. The required instrumentation is shown in Figure 10-9. A detailed quantity takeoff and estimate is then developed and this is in Figure 10-10. The estimating data comes from Richardson's Estimating manuals. Figure 10-1 1 shows the development of allowances for indirect costs, sales tax, contingency, contractor's profit and bond. The final estimated cost is then the contractor's Bid price. 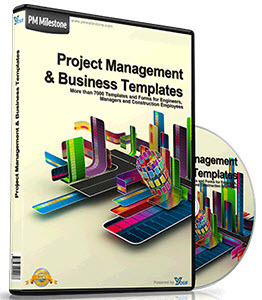 Two cases/examples of project organization/execution are illustrated. The first example covers contract strategy and the second case shows the "creative analysis" of a unit price contract for equipment foundations. Experience and case histories have clearly indicated that many projects slip schedule and over-run cost because of an early, poor contract strategy. This case outlines the typical conflict of schedule priority versus minimum risk. These objectives are mostly conflicting objectives and a very careful analysis of contracting options is required to resolve this dilemma. 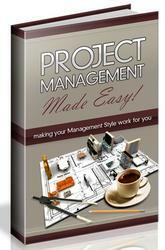 You are an owner or client, with limited/little project experience. A feasibility study/estimate of an E.P.C.project has been completed. The project is required as soon as possible. Of the many types of contracts, which arrangement would you recommend, and why? Figure 10-12 illustrates a typical contract strategy. "Creative analysis" is essential for effective project execution. Figure 10-13 illustrates a typical contract cost/schedule report. The progress figures have been removed, so that the example can become a case study for evaluation. The analysis indicated in Figure 10-14 shows that the reported progress figures were impossible and, therefore, the estimated quantities for rebar and concrete were incorrect. Judgment on the percent (%) complete numbers then allows a cost evaluation to be completed. This evaluation shows a cost overrun of the original contract value. The final analysis in Figure 10-15 considers the contractual implications of a contract "claim" and the final prediction of cost, for the contract. Figure 10-1. Work Breakdown Structure. Figure 10-4a. Work/Breakdown Structure and Schedule Assumptions. Use following WBS (activity list) to develop schedule. a) 40 hour work week, discounted to 37 for absenteeism. b) Strict observance of concrete curing spec of 25 days (3.5 weeks). c} Use "simple" calculation techniques for durations, d) Piping to vessels/pumps (item h) cannot start until towers piping (item n) is completed. el Develop activity durations in weeks. Assume construction work is carried out on a shutdown basis. a) 7 day working with 2 10 hour shifts. b) No discount of 10 hour days for absenteeism due to "overmanning." c) Enter all (21) listed activities on attached blank network. d) Assess individual crew sizes. Figure 10-4b. "Economic Construction Schedule - Sub Area Plot IV.